The California Bear Flag and the University of California football team the Golden Bears emblemize the great animal that has been extinct in California since the 1920s but once numbered perhaps as many as ten thousand in the state. 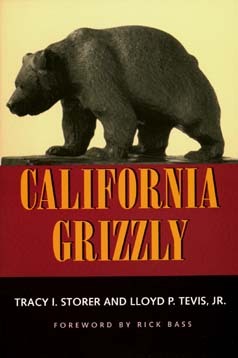 Forty years after its original publication, University of California Press proudly reissues California Grizzly, still the most comprehensive book on the bear's history in California. The lessons of the book resonate today as the issues of protection of wildlife habitat versus unfettered development of land for human use are debated with increasing urgency. Tracy I. Storer and Lloyd P. Tevis Jr. were both Professors of Zoology at the University of California, Davis. Tracy Storer co-authored Sierra Nevada Natural History (California, 1963). Rick Bass is the author of The Lost Grizzlies (1996).